But all I can say is Thank God! They shut down Government Street during the fire. We'd probably have had to evacuate had it happened earlier in the evening. Wouldn't that have been awful?! I shudder to think! But God knew. He is good! He can be trusted! Wow! Praise God! Fire destroys 2 buildings on Louisiana Ave.; damages 1 on East Blvd. An off-duty East Baton Rouge Parish Sheriff’s deputy driving south in Interstate I-110 spotted the start of a large fire Saturday night that totaled two homes on Louisiana Avenue, damaged another and injured one firefighter who was treated at the scene. The sheriff’s deputy pulled off the Interstate and called firefighters at 10:21 p.m. to notify them of the blaze, Baton Rouge Fire Department spokesman Howard Ward said. Firefighters arrived at 980 Louisiana Ave. after the fire had already spread to two other buildings and was endangering another. A second alarm was called and about 50 firefighters were eventually on scene to battle the blaze, Ward said. It took about 80 minutes before the fire was completely under control. Two vacant homes at 974 and 980 Louisiana Ave. were flattened by the fire and an office occupied by real estate appraisers next door at 301 East Blvd. was heavily damaged in the fire. 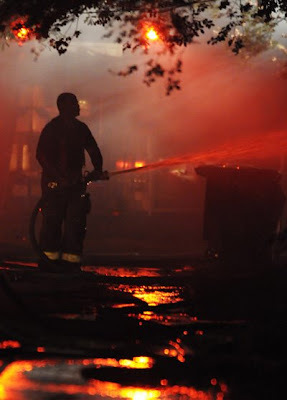 Government Street was briefly closed while firefighters kept a 5-foot-wide hose stretched across the street to provide water for dousing the flames. Fire investigators were on the scene trying to determine the cause of the blaze, but Ward said it could take more than one day to do so while they try to determine where the fire originated and what caused it. One firefighter was injured and treated on scene from exposure to electrical wires. I couldn't agree more...the wedding was perfect! Everything was so beautiful. I think the thing that impressed me the most was the fact that it was a beautiful picture of two people receiving a godly inheritance from their families...the blessings of the fathers, the unity & love among the families, the prophetic word spoken over their marriage & ministry, Josh exposing his heart so freely through that incredible song...all of it, simply amazing! I'm so happy for them! And for you...I'm sure having the confidence that this is God's plan has made a huge difference. it was obvious that God was in every detail! I was encouraged, too, to know the potential that my girls have...thanks for allowing us to be part of that! and to be able to witness it!